On a Sunday afternoon in February, the staccato chords and rousing bass lines of a Hammond B-3 organ shook the walls of American Legion Post 398 in Harlem. Hundreds of people had crammed into the humble basement bar to pay tribute to the organ’s owner, the musician Seleno Clarke, who had died in December at 87. Some said prayers. Some read poems. But mostly they played jazz. It might have been a strange sight for an American Legion post. The veterans service organization has struggled to keep up membership nationwide, but Post 398’s reputation as one of the last authentic jazz venues in Harlem has kept its seats full and the atmosphere popping. Every Sunday night for nearly two decades, an unlikely mix of aging veterans, tourists and musicians from around the world have come to enjoy cheap drinks, Southern-style home cooking and jazz. Legion members say Mr. Clarke’s death left an irreplaceable gap in their close-knit community. Today, the organist can still be spotted smiling, always wearing a suit, in many of the photos lining Post 398’s yellow and blue walls. But Mr. Clarke’s former bandmates, on a mission to uphold his legacy, are tightening their sound, broadening their repertory and playing with more enthusiasm than ever. Post 398 occupies an inconspicuous brownstone on West 132nd Street. The music started in 1998, after Mr. Clarke bought the Hammond B-3 — a legendary instrument played by the likes of Fats Waller, Count Basie and Jimmy Smith — but soon realized there wasn’t space for the 425-pound machine in his Bronx apartment. An Army veteran and Legion regular, Mr. Clarke asked if he could store the organ at Post 398. The post commander at the time said yes, as long as Mr. Clarke agreed to play. Already a well-known performer around the city, Mr. Clarke started his Sunday afternoon sessions with only a drummer to accompany him. As the informal gigs grew in popularity, he pulled in friends from established venues like Showmans, Smoke and Pepper-n-Salt. He added a saxophonist, a guitarist and the occasional singer, forming the Harlem Groove Band. 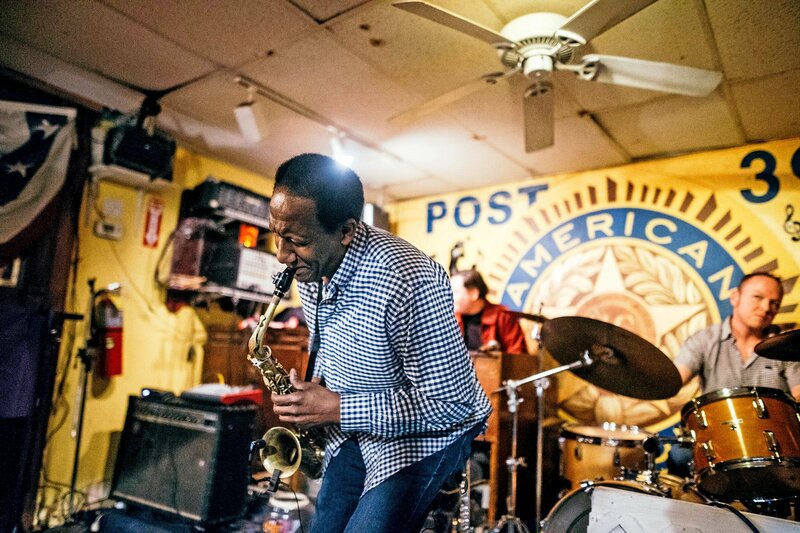 In a few years, Post 398 had become an unlikely hot spot to jam on a Sunday night in Harlem. Big names showed up, too, including the filmmaker Spike Lee; Charles B. Rangel, the congressman representing Harlem and Washington Heights at the time; and the musician George Benson. Mr. Nielsen is now one of two organists sliding into Mr. Clarke’s seat at the Hammond on Sunday nights. The Harlem Groove Band includes four regular musicians in addition to Mr. Jones, but every session features familiar stand-ins, many of whom have been playing with the band for years. Sundays bring a handful of walk-ins, too, who wait eagerly for a chance to play. They always get their turn. Even rarer, Mr. Nielsen and Mr. Mahiri said, is a venue that still has a real organ. In many clubs, if the set includes an organ at all, the instrument has been replaced by a digital keyboard, which lack the Hammond B-3’s iconic and singular sound. In jazz, when an organ is included, it joins the drums in forming the rhythm section of the band. Sean Cameron, 40, the drummer for the Harlem Groove Band, started playing at Post 398 in 2003. Over time, his vibe became deeply meshed with Mr. Clarke’s grooving style. Mr. Cameron initially had trouble imagining a next chapter for the band with Mr. Clarke gone. But then he saw a transformation in Mr. Jones, who he said subtly adopted many of Clarke’s paternal tendencies. Though much will stay the same, the band is starting to experiment a bit more. In the old days, the band mostly played songs written by Mr. Clarke. Under Mr. Jones, leading the way on his shiny Selmer Mark VI saxophone, band members are playing around with different styles — everything from progressive to modern to hard bop and blues. Many nights, Mr. Jones simply asks band members what they want to play and lets the music take them from there. Sessions still close, however, with “BJ Blues,” a song Clarke wrote for his longtime partner, Brenda Chapman. It was the last song Mr. Clarke played at Post 398, on a December night last year when his ailing body had the energy for only two songs. “It’s a swinging shuffle blues that grooves like hell and defines everything that Seleno was about,” Mr. Jones said. An earlier version of this article misspelled the surname of one of the organists in the Harlem Groove Band. He is Judd Nielsen, not Judd Neilsen.